"Contemporary mainstream psychology has moved toward methodological specificity bounded by instrumental experimentalism. However, this institutional reduction of sanctioned methods has not been fully embraced by all social scientists, nor even by all experimental psychologists. The social sciences are rife with examples of practicing empirical scientists disaffected with the reductionism and atomism of traditional experimentalism.The empirical theory and practice of four of these disaffected social scientists--Lev Vygotsky, James Baldwin, James Gibson, and Kurt Lewin--is explored in this volume. Each of the scientists considered here argued for a rigorously empirical method while still maintaining a clear anti-reductionist stance. 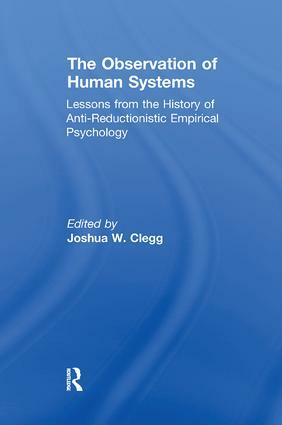 They justified their disaffection with the dominant psychological paradigms of their respective eras in terms of a fidelity to their phenomena of study, a fidelity they believed would be compromised by radical reductionism and ontological atomism.The authors in this collection explore the theory and practice of these eminent researchers and from it find inspiration for contemporary social science. The primary argument running through these analyses is that the social sciences should take seriously the notion of holistic empirical investigation. This means, among other things, re-establishing the indissoluble ties between theory, method and procedure and resisting the manualization of research procedures. It also means developing theories of relations and not simply of elemental properties. Such theories would concern particular units, fields, or systems of relations and not be reduced to, or interpreted in the terms of, other systems. Finally, a holistic social science requires integration of the active agent into theory, method, and procedure, an integration that points toward both participatory and emancipatory methods."